(l-r) Katherine Waterston as Tina, Eddie Redmayne as Newt, Alison Sudol as Queenie and Dan Fogler as Jacob in FANTASTIC BEASTS AND WHERE TO FIND THEM. ©Warner Bros. Entertainment. CR Jaap Buitendijk. Likewise, Harry Potter’s one-of-a-kind creator J.K. Rowling has served up a tasty new concoction that seems distinctively hand-crafted instead of mass manufactured, with enough of the author’s signature charm to please both longtime fans and newcomers to her fascinating fantasy universe. “Fantastic Beasts ” originated as Rowling’s 2001 facsimile of a Hogwarts textbook purportedly written by “magizoologist” Newt Scamander. 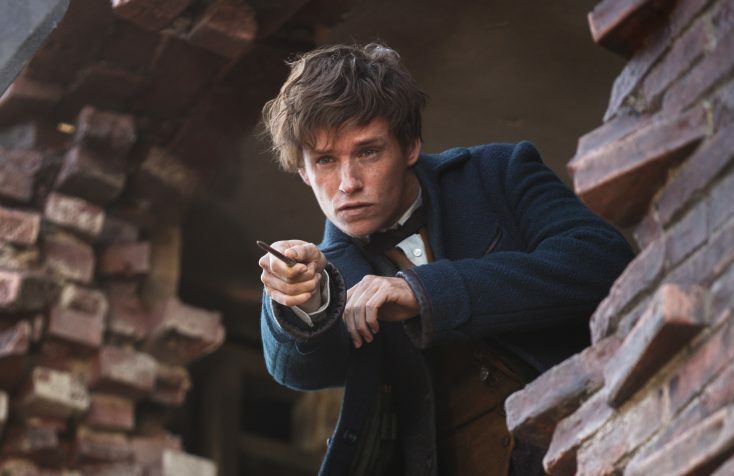 Expanded into Rowling’s first screenplay, the movie finds Scamander (appealingly embodied by Eddie Redmayne) arriving in 1926 New York with a magic suitcase full of wildly imaginative creatures, not all of whom want to stay put. The plot follows his efforts to track down the wayward ones, avoid the wrath of a worldwide wizarding council upset by the attention he’s attracting to their secret community, and locate a destructive monster that’s wreaking havoc on the Big Apple. The tone mirrors the storybook style of Rowling’s Potter books and their movie adaptations, all of which had dark undercurrents grounding their flights of young-adult fancy. Director David Yates, who helmed the final four of the eight Harry Potter installments, maintains stylistic continuity with those films by keeping a sense of menace that tempers the lighter moments. Redmayne is good at portraying Scamander as a socially awkward but passionately committed defender of the dangerous but endangered. Although he nervously avoids looking people in the eye, he’s brave enough to confront, capture and shelter a variety of beasts that are genuinely beastly. The film cleverly expands the Potter-verse to America, where the nickname local wizards have for anyone without magical powers is “No-Maj” instead of “Muggle.” The primary one of those here is baker Jacob Kowalski (a likeably restrained Dan Fogler), who accidentally becomes involved in the perilous proceedings. Acting as the audience’s wide-eyed viewpoint character, his “I don’t think I’m dreamin’, I ain’t got the brains to make this up” shock gives way to an endearing go-with-the-flow acceptance. Tina Goldstein (“Inherent Vice”‘s Katherine Waterston), a demoted wizarding council investigator who hopes to reverse her fortunes by apprehending Scamander, instead becomes his on-the-run ally. Unfortunately, the plot slows to a crawl when she takes him to the apartment she shares with her psychic sister Queenie (Alison Sudol of Amazon’s “Transparent”), where things seem more sleepy than dreamlike. Queenie’s later relationship with Jake, however, is one of the movie’s sweetest aspects. Colin Farrell is excellent as the coolly cruel Director of Magical Security at MACUSA (the Magical Congress of the United States of America). Examples of the movie’s elaborate production design at MACUSA HQ include self-typing typewriters, a memory-pool execution chamber and a massive clock that includes designations such as “Severe Unexplained Activity.” The period costumes by Colleen Atwood, including Scamander’s soon to be iconic blue overcoat, also deserve praise. Renegade dark wizard Gellert Grindelwald is the big, bad but mostly offscreen main villain. As dreaded and feared as Harry Potter’s nemesis Voldemort, Grindelwald (portrayed by a surprise-cameo actor whose identity is destined to be a poorly kept secret) may play a larger role later in the projected five-film franchise. Besides the obvious Potter parallels (hidden-world wonders, importance of tolerance for outsiders, Scamander’s Hagrid-like conservation impulses), the movie contains echoes of everything from “Jurassic Park” (Kowalski’s sense of awe during his first trip into the rather-bigger-inside-than-it-appears suitcase) to “The Avengers” (a colossal amount of citywide destruction when the dark force goes on a raging rampage). With a hilariously calamitous slapstick jewelry store rescue and an unexpectedly touching love story thrown in, this flick has something for everyone except the coldest-hearted Dementor. The movie’s score is by James Newton Howard, but the first music heard under the opening credits is the John Williams “Harry Potter” theme, which sets a pretty high bar for what will come after. 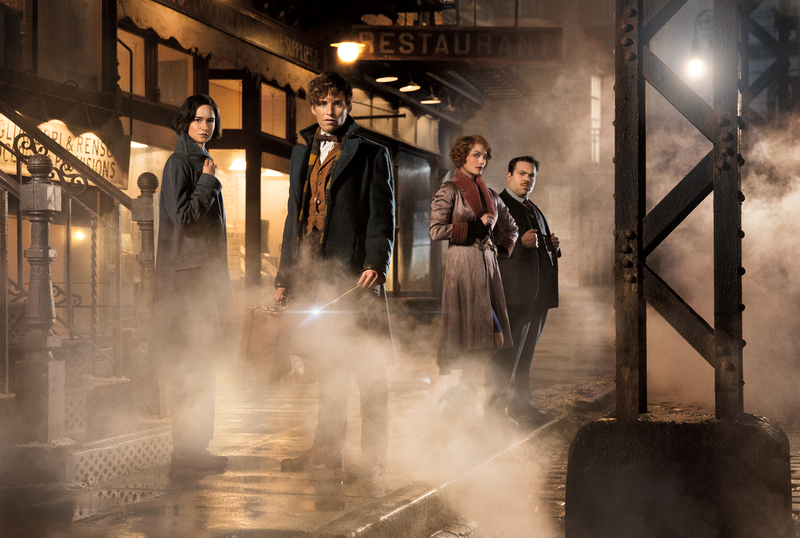 Even with some pacing problems and what might be a few too many very-dark-of-night scenes, “Fantastic Beasts” is both a worthy successor…and predecessor…to the adventures of Harry and company.